Inverted Bond Yield – Harbinger of Recession? I’ll begin by warning you that this is one of those investing topics, I will claim to have very little understanding of. I thought I might learn a little bit about it through the process of writing this piece. Perhaps you will learn a little too. The yield of bond rates has become inverted recently for the first time in since 2007. This means that the short-term bond interest rate (typically the 3 month note) is actually higher than the 10-year bond interest rate. 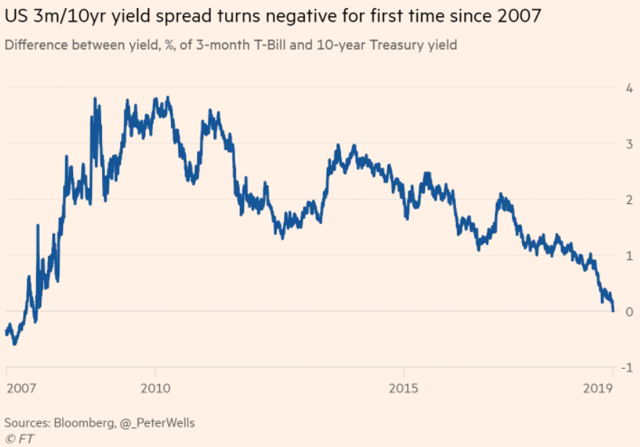 This is viewed as a signal that a recession might be on its way, as investors aren’t being given a higher interest rate for the risk that comes with holding onto a note for a longer period of time. The financial media went into alarm mode last week as the last time this happened, we were just 12 months from the Great Recession. Higher short-term rates are a drag on corporate investment and consumer spending and a inversion of US Treasury has preceded all but one recession over the last 50 years. The inversion doesn’t predict the severity of the recession, but it often predicts what might happen in the next 12-24 months. Curiously, some believe that the inversion is just a result of the Federal Reserve getting ahead of investors in pushing up interest rates and that things will balance out in time. The Fed controls short term rates, but the market determines long-term rates. The New York Fed even tracks the likelihood of inflation based on bond yield inversions and a couple weeks ago they forecasted just a 24.6% chance of a recession in the next 12 months. Other than some stock options that we’ve been gradually exercising recently (MegaCorp up 30% this year!! ), we carry about 3 years spending in cash. Our aim is to have this as insurance against a recession. Most experts seem to suggest 18-24 months cash reserve, so we think we are being conservative in protecting our FIRE nest egg. Still, it’s interesting to watch the machinations of the global economy and see how slower growth in China and the EU are impacting our own investments. We’ll see how things play out. Any predictions from readers? Does this make you want to move to more conservative investments? Thank you for this post. I do believe there will be some kind of recession in the next 5-10 years. I don’t know when and I don’t think the inverted bond yield will make it come any closer to when it will actually happen. This news to me is more of the same that has been echoed by vanguard and others. The economy and stocks can’t go up forever. When it will come down, no one knows. I do think it’s dangerous to be in 100% stocks in the current market conditions though. I will be continuing the course on my current stock bond allocation at 65% stocks and 35% bonds. Rebalancing every six months. Agree – undoubtedly a recession will come in time, since “you can’t build a tower to the sky”. Our investment mix stays the same regardless of this latest news. The WSJ ran an article on the inversion this morning, but didn’t seem to worried. I try not to predict or respond to markets. Long term goals supported by long term strategies allow for a steady hand on the tiller. Recessions come. Recessions go. Stay the course. Weather the storms. Keep our eyes on the compass. Thrill to the adventure, even when headwinds are fierce and seas are treacherous. Fair winds will come again. “Thrill to the adventure” – Love that phrase! With respect to markets coming and markets going – I saw a Fed leading indicator graph online recently. It shows that the Fed is pretty unreliable when it comes to predicting recessions themselves – even with all of the data that they have. Stay the course!